"North Asian Magic: Spellcraft from Mongolia, Manchuria, and Siberia" by David Borji Shi will be released by YIPPIE (The Yronwode Institution for the Preservation and Popularization of Indigenous Ethnomagicology) in May, 2016. Free copies will be included in the goody-bags distributed to all attendees at the February 14 - 15, 2016 Hoodoo Heritage Festival in Forestville, California, and David will be teaching a workshop on the subject as well. After that, the book goes on sale to the general public, via Lucky Mojo, Amazon, and metaphysical shops around the country. Here is a topic you will not want to miss -- folk magic from Mongolia, Manchuria, and Siberia, the real deal, and plenty of it in a straightforward, practical, and fascinating package for only $9.00. This looks very interesting, and the cover art is quite intriguing. I have never seen a book on North Asian magic, and know nothing about is, soI will be buying this when it comes out. I liked YIPPIE's "Trolldom" book from a couple of years ago (on Scandinavian magic) and I like the way YIPPIE is publishing these introductions to the folk magic of various cultures. What's next. I wonder -- ? 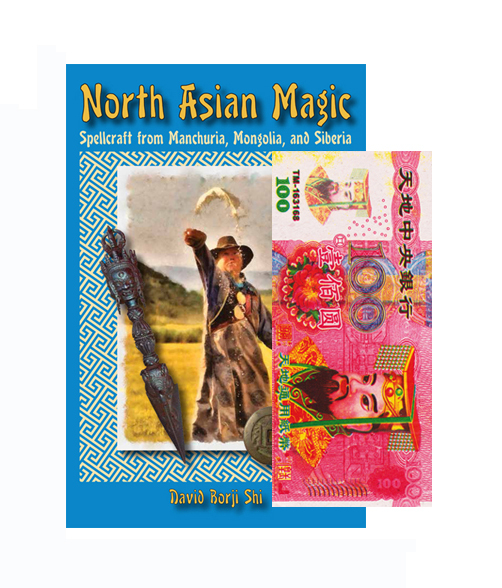 North Asian Magic by David Shi went to the printers this morning! It is a brand-new look at a culture whose magical traditions run deep and whose geographc region is enormous! If you are a student of world culture and folk magic, North Asian Magic will open your eyes to a world of beliefs, practices, and customs that will blow your mind -- look for it on sale in Mid-May! Thanks to all who helped behind the scenes, including Michele Jackson on illustrations, Grey Townsend on cover design and composition, Nagasiva Yronwode on production, and Charles Porterfield and Papa Newt on proofreading! Huzzah! This is the second book to be published by YIPPIE as part of our world-wide survey of practical folk-magic spells from various cultures. North Asian Magic is a book that you will find fascinating and eye-opening because of the previously undocumented territory it encompasses — but even more, it is a valuable grimoire ready for you to put to immediate use in your own magical work. Add a little North Asian spice to your spells -- you'll be glad you did! On sale in mid-May! My family never told me much about their past, but my grandmother did tell me some information about festivals and courtship beliefs. I have never travelled to where they came from, so I thank you for this book on North Asian Magic. If you don't mind me asking, where does your family come from? North Asia is a very broad region and my book tends to focus on certain areas a bit more than others; in addition to what's in my book, I may be able to help you shed some light on folk practices of your ancestors' region(s). I ordered North Asian magic a while ago but did not have time to read it until this week. It is a short book filled with folkloric treasures. These spells and rituals are never going to become common magic in America, so thanks to the Yronwode Institution for taking the risk to publish something for a small audience. It is greatly appreciated. Please consider liking the page if you want or enjoy the book; you will receive updates now and then with information, pictures, and videos that are related to topics discussed in the book. Mr. Shi, I am so far on the 18th page of what is an excellent book. Your book, a book I have been waiting for a long time for: a book on folk magic in Asia. Thank you. I will see you on Facebook. 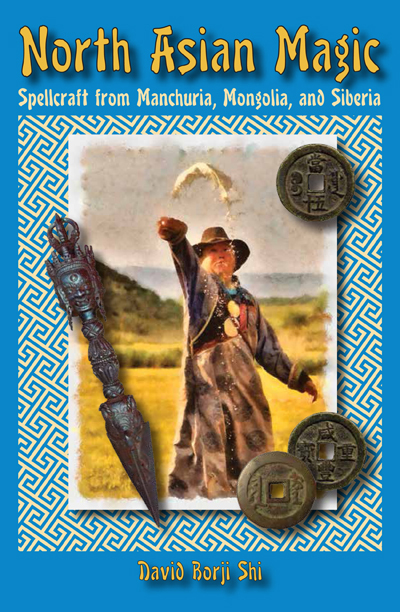 "North Asian Magic: Spellcraft from Manchuria, Mongolia, and Siberia" -- plus a package of Taoist Hell Bank Notes -- is the winning combination in Lucky Mojo's Facebook Fridays! giveaway for Friday, September 14th, 2018. Four identical prizes will be distributed. Be sure you enter at Facebook for a chance to win. It's Facebook Fridays! for September 14, 2018, and we want to introduce you to the power of North Asian Magic! The Lucky Mojo Curio Company is hosting a random drawing to give away 4 enriching and enlightening spiritual supply prizes. This week each lucky winner will receive a copy of David Borji Shi's "North Asian Magic: Manchuria, Mongolia, and Siberia", an explication of the extraordinary range of beliefs and practices from Northern Asia. And, in addition, each winner will receive a packet of Hell Bank Notes; the currency of the Emperor of the Underworld, to burn so that earthly riches can be sent to your ancestors in the afterlife. First thing tomorrow morning, we will select FOUR winners at random, announce their names here, and ask them to message this Facebook Page with their mailing addresses, so we can send them their FREE North Asian Magic products.